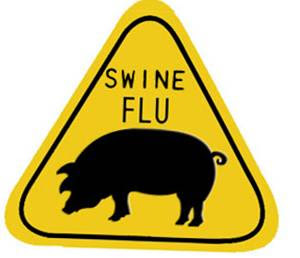 Swine Flu or Swine Influenza is caused due to a virus of pig, H1N1. It is a lethal virus. According to WHO, over twelve thousand cases are reported during last one year. H.N. in 1918. It causes over 20 million deaths. Swine Flu (H1N1) was started in March 2009 from Mexico. Primary symptoms are – Headache, Fever, Soaring Throat, Cough and Body Ache, Fatigue, Abdominal Pain, Diarrhea and Severe Vomiting. Serious symptoms are – Worse cough, Pneumonia, Pain or Pressure in Chest, Bluish or grey skin color, low blood pressure due to dehydration, no desire of liquid intake, Loose Motion, unable to interact, Dizziness and Confusion, Body Temperature rise up to 104 C.
Vaccination of Swine Flu is available in Pakistan. About 200 cases are reported in Pakistan from which 50% are from Karachi. Keep away from pigs. Inform your local municipality, if there are pigs in your area. Don’t get close to infectious patient. Also don’t shake hand or embrace with patient. Use face mask before going to a crowded place. Dump used tissue papers properly. Patient should be kept at home in an isolated room or in hospital. Wash your hands with soap after using toilet. Flow tab water on your hands for about 30 seconds. Always use confirmed and guaranteed Halal foods. Instruct your children about cleanliness. Dial 0800-12012 toll free number for further information and doctors'advice on swine flu. Bird Flu is also due to a virus of pig, which is transmitted to poultry through their feeds as pig fat was used in some feeds of birds and poultry. But now Supreme Court of Pakistan has banned import of such feed in Pakistan.